Those who have passed through the small camping spot of Urdukas on the way to the higher giants of K-2, the Gasherbrums, or Broad Peak may have seen the Trango Tower massif across the mighty Baltoro Glacier. The east face of Great Trango Tower and Nameless Tower (AKA: "Trango Tower") are among the largest vertical faces of the world. It wasn't until 1975 that the area opened for climbing after being closed for many years and Nameless Tower was ascended for the first time by a strong British team on their second attempt in 1976. Not until 1987 did Nameless Tower see its second ascent by a new route by a Yugoslav team. 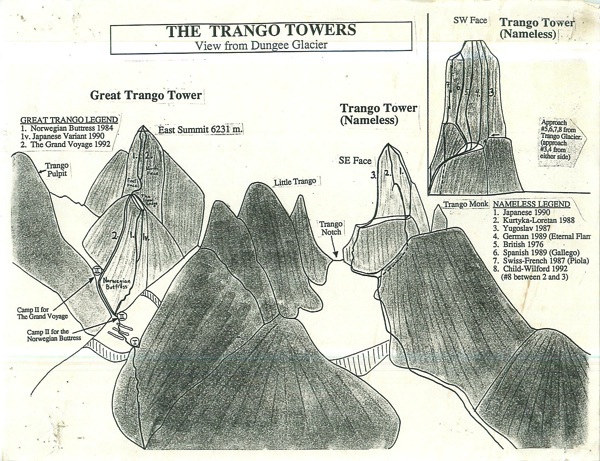 Great Trango Tower's main summit (6286 m) was first climbed in 1977 by Galen Rowell, John Roskelly, Kim Schmitz, and Dennis Hennek by the easiest route up the western side. Great Trango is rather a large peak with three main summits, all over 6000 meters. In 1984, the 5000 foot Norwegian Buttress was the first route established on the massive East Face, which led to the first ascent of the East Summit (6231 meters). See Appendix A for a complete list of ascents on Great Trango and Trango Towers. To date, Nameless has 8 routes to its summit, all on its Southeast and Southwest faces. Great Trango has 2 big-wall routes (and one variation) up its East/Northeast Face. Several alpine routes go up the Northwest and West sides of Great Trango. The wall routes are on good quality granite which resembles a cross between the clean compact granite of Yosemite and the coarse granular granite of City of Rocks. Nameless Tower is more featured than Great Trango with more cracks and possible lines. 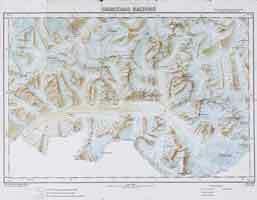 Routes on Nameless are approached from either the Trango or Dungee Glaciers, while Great Trango's wall routes are appoached from the Dungee Glacier. Great Trango's approach is more serious and dangerous than the Nameless approaches. In general the weather was fine for our recent 1992 expedition in June and July. It never got excessively windy and the storms were generally mild, though at times they got fierce. Later in the season is also considered fine (August, September), but the frequency of avalanches increases later in the season making some of the approaches too dangerous. This area of the Himalaya sees very little monsoon action. Many of the routes have been established with siege tactics (i.e. large quantities of fixed ropes) which is a more cautious method of ascent but cumbersome and time consuming. The Norwegian Buttress was established in the purest of pure form, with only six ropes used for the entire climb. The Grand Voyage was also established in this style (known as "Capsule Style"). This summer, two teams of Spanish climbers repeated routes in fast time on Nameless Tower with minimal fixed ropes and gear. Big wall racks, selection depends on route. Ice gear for the approach and for the summit. Portaledges are required for most routes. Immunizations: Gamma Globulin (for Hepatitis A), Diptheria-tetanus (if not current), oral Typhoid, oral Malaria recommended (none required). Check with the State Department or the U.S. Public Health Service for current international health warnings: 202-647-1488. Fly to the Islamabad/Rawalpindi airport. Excess baggage charges vary with each airline, so check this out before committing to the cheapest flight. Also, switching carriers somewhere along the way may be cheaper but guaranteed to be a major hassle. British Airways and Pakistan International are the two international airlines to Islamabad/Rawalpindi. NOTE: Ticket price may be the same for a flight to Skardu (via Rawalpindi). RAWALPINDI: DO NOT PASS GO. PERMITS AND PAPERS. Once in Rawalpindi, much has to be done before a team can get to the mountains. Plan on at least 4 or 5 days in Rawalpindi. Many expeditions hire an agent in Rawalpindi, who will help with all the red-tape details, arrange for travel to Skardu and Askole, and set up a guide for the porters. An agent in Rawalpindi is a good idea to get you around the first time. Cost: $300 and up. 1. A residence permit (available at the police station) and a "preliminary briefing" with the Minister of Tourism is required. The leader of the expedition meets with the Minister and discusses matters like insurance and equipment for the Liaison Officer, and set up a date for a formal briefing, in which all members of the expedition must participate. 2. An army officer (the Laision Officer, or "LO") is assigned to each expedition. This fellow is usually under the impression that he will be an active climber on the trip, and must be appeased. In addition to wages, the LO must also be outfitted with a full expedition kit, which is a big incentive for the army officers to volunteer for the expedition. The best thing to do here is plan on buying cheap but new items for the officer, as he will invariably be disappointed with a used but excellent North Face Gore Tex Jacket and appeased with a cheap but new K-mart plastic one. A list of 25 items including new boots, a sleeping bag, tent, and full clothing is required. Some but not many of the items can be purchased in Pakistan. Details of the LO's clothing and boot sizes are sent after approval of the Permit. LO wages: $12/day while in Rawalpindi, and $6/day in the mountains, plus kit. 3. A cook must be hired and outfitted too. At our hotel, we had several people offer to be our cook. Letters of recommendation are helpful to look at, but view them with suspicion (our cook's letter was exposed at basecamp when we found it belonged to the cook for the Spanish team with whom we shared basecamp with; notwithstanding, our cook proved to be a fine fellow) Cost of Cook: $6.00/day, plus food. 4. Each porter must be outfitted with three items: shoes, socks, sunglasses. The best value for these items is in Rawalpindi. Cost: approximately $6 per porter. 5. Insurance for the porters, the cook, and the LO (all Pakistanis who will go to the mountains with you) is required and can be obtained in Rawalpindi. 6. Two major insurance bonds must be put up: one for the environment $1000, and one for rescue, $4000. These bonds are best set up with an insurance company in the U.S. If the camps are kept clean and no one needs a helicopter, both these bonds are returned. In addition to these bonds, a $200 environmental non- refundable "contribution" is required. 7. Shipped items must be collected in Rawalpindi. Itemized (!) customs clearance must be shown to the Minister. 8. Bring photos for police and the Ministry of Tourism (4 total). 9. When everything is at long last copacetic, the Minister will approve the expedition at the final briefing. Kitchen for basecamp: Large kerosene stoves, lanterns, cook kit. Miscellaneous kit items for LO, Cook. Tarps for porters and for basecamp. Containers for 55 pound loads (as many as needed). Most of the basecamp food can be procured in Rawalpindi. (Certain bulk items like flour, kerosene, and cooking oil can be purchased in Skardu.) Finding the right shop in Rawalpindi can be tricky, but once found, good quality items at a good price are to be had. Examples: biscuits, rice, lentils, powdered milk, canned cheese, tang, tea, sardines, tuna, sugar, garlic, onions, potatoes, spices, noodles. For the climb, it seems best to bring most of the provisions from home, such as dried beans, powdered potatoes, dried veggies, 2-minute noodles, lots of drink mixtures (tea w/ sugar, coffee, fruit drink, cocoa,soup mixes), chocolate, candy, plain biscuits, sugar biscuits, cheese, jam, butter, chocolate, dried fruit and muesli. General Rule of Thumb: approximately 2.2 pounds (including minimal packaging) of food per person per day. General rule: If its not hot and freshly cooked, don't eat it (no salads or anything rinsed in tap water). Wash hands before meals. Chai (sweet tea with milk) is generally safe, as well as bottled soda (make sure cap fizzes when removed). A water purifier for hotel tap water saves money on bottled water. Once all the regulations have been met in Rawalpindi, its time to move to Skardu, the capital of the Northern Territory. It's possible to go overland by bus for $300/team. This takes over 24 hours and is exhausting but beautiful. The other way is to fly (also bueatiful), for $30/ person, plus excess baggage charges. Flying is recommended unless you desire a true cultural and wild experience. Skardu is the last outpost of any size, and is a good place to buy items like flour, kerosene, and cooking oil. Most items are available, but at a higher price than in Rawalpindi. Once in Skardu, porter loads and jeeps for the ride to Askole must be arranged. The jeep road to Askole was finished just recently, and is a great boon to expeditions to the Baltoro. Our expedition required 3 jeeps (and drivers) for our 5 members, cook, LO, and 46 porter loads (2530 pounds of food and equipment). A scale is necessary equipment here, as is an abundance of containers. The 50 and 100 gallon plastic expedition barrels that most of our gear was packed in were the best. Containers of manageable sizes may be hard to find in abundance in Skardu. Having at least one good sturdy wood box for a basecamp kitchen table is nice. Askole is a tiny village with no goods available, and is the starting point of the trek in to Basecamp. The porters will be officially hired here; during the season, many porters are available in the nearby camping spot of Chango. It's a three day, 50 mile trek to Trango basecamp. Cable and bridge crossings have tolls, so one member must be on hand with the kitty to pay for each porter and member at these river crossings (usually 15 rupees, or 60 cents/person). Porter wages for the 50 mile trek: $50 each. (55 pound maximum). 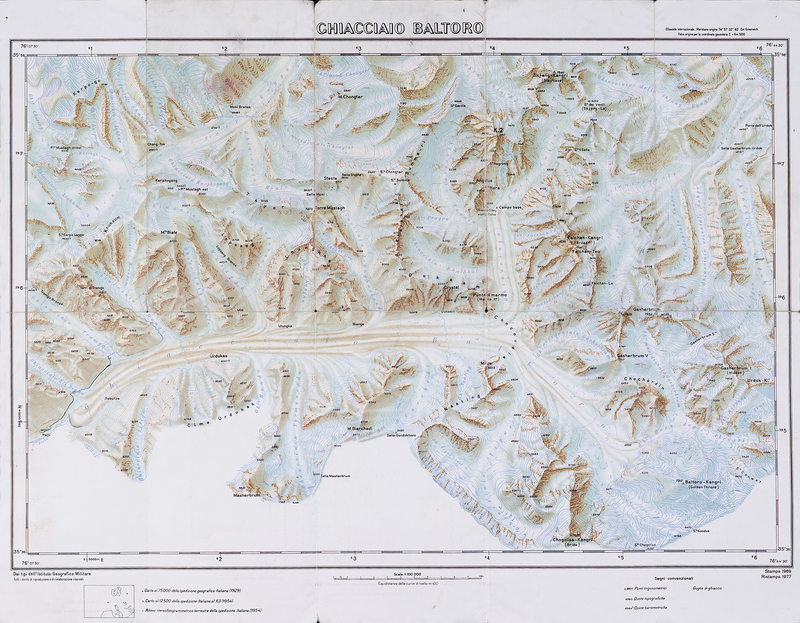 Basecamp location will depend on the route planned, but there are several good sites on each of the Trango and Dungee glaciers (two members may want to scout basecamp ahead of the rest of the expedition party). A comfortable basecamp is key to getting rest during the down times. Due to the long and sometimes technical approach to these climbs, several intermediate camps may be required to get to the base of the climb from basecamp. Timing for the routes is critical, due to the weather, so hanging out at a nice basecamp is critical for proper positioning. Individual member tents, as well as a well-built kitchen (stone walls are readily built, bring tarps and lots of cord). Sturdy boxes or even lawn chairs are nice items. Keep the mountains clean. At basecamp, keep trash in one place. When the expedition's over, let the porters take what they want, burn what will burn, and toss the ashes and the rest into a deep crevasse in the glacier (batteries and other toxic items should be carried out). We made a decision to carry out our 110 pounds of garbage (2 porter loads) at the end of the expedition. After carrying it almost all the way to Skardu, our Laison officer got tired of seeing us lug it around, and dumped it all into the Braldu River, which it was most likely destined for in any case. Personal Gear: A complete set of cold weather expedition gear is needed. See Appendix B for a complete list. Communal Gear: Water purifier (for city tap water and for glacial melt), radios, shovel, spring balance for weighing loads, communal wallet for kitty, black water bags for melting snow with waterproof closure and valve, spare cord for porters, binoculars. First Aid Kits (2 separate kits needed): Full Medical kit for basecamp, and kit for the climb. Kits should include as a minimum: light pain killers, heavy pain killers, antibiotics (Septra DS, erythomycin, Cipro), Flagyl for amoebic dysentery or Giardiasis, antidiarrheals, antibacterial ointment and wound items, eye wound items, iodine for purifying water, antihistimanes, anti- inflammatories, general repair kit, and items like sunscreen and moleskin. General repair kit: knife, small sewing kit, sewing awl and thread, duct tape, cloth tape, candles, baling wire, parachute cord, crampon tools and spare parts, nylon patches. Cooking gear for the climb: Two climbing stoves: one hanging propane/butane (Markill Stormy is best) with a length of uncoated malleable copper wire for constructing a heat exchanger, and one kerosene burning stove for melting snow (the MSR XGK is unsurpassed), repair kit, and fuel bottles (up to 10 liters). Count on one gas cannister or half liter of fuel per day for 2 people. In addition to Markill Stormy pots, one extra large pot with lid for melting snow. The summits of Great Trango and Nameless are over 20,000 feet, so Acute Mountain Sickness (altitude sickness) is definitely to be considered, although the pace of a wall route, where climbers are usually averaging less than 500 feet of altitude gain per day, acclimatization is given time. Diamox has been used widely to prevent and to reduce the symptoms of AMS. Be aware that it is a diuretic, so additional fluids must be consumed, and also that some serious side effects have been reported. 2nd 19? Swiss or French team??? West Side "
4th 1988 Giordani (Italian) solo NW ridge "
Note: the Norwegian Buttress was climbed to the rim but not the summit by both a Japanese team in 1990 and a Spanish team in 1991. Trekking poles and brim hat. Miscellaneous: many small packets of energy type drink mix., hacky sac, baggage tags. List for 5 people to go into the mountains. Note: this list assumes that all members are fully outfitted with climbing, camping, and personal gear. Also excludes "kit" for Laision Officer and cook. Also excludes airfare to Rawalpindi. Total $10,700 for 5 people = $2140 each.